Will the remanufactured distributor that you offer fit my engine? 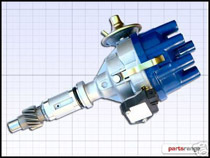 This distributor is suitable for both fuel injected and carburetted engines post 1976. The drive gear on the bottom of the distributor shaft has the female oil pump drive which the Rover V8 engine started to use after 1976. Although you can convert the drive gear so that the female oil pump drive is not present (as required for the later Serpentine engines with their crank shaft driven oil pump) there is no male oil pump drive on the base of the shaft to turn the pre 1976 oil pump. The remanufactured Rover V8 distributor with standard ignition amplifier. Along with fitting a distributor with good ignition output and advance curves it is also important to consider upgrading to Magnecor plug leads as these will cope with a higher spark output than standard leads.